clay and limestone: Wildflower Wednesday: A Different Kind of Aster, It Clambers, It Climbs, It's Fragrant! Wildflower Wednesday: A Different Kind of Aster, It Clambers, It Climbs, It's Fragrant! Sometimes we make a decision to plant a native that's not from our neck of the woods and might require a bit more work care than usual. That's what I decided when I saw Carolina Climbing Aster at my favorite native plant nursery. Here's my Wildflower Wednesday story. south-west facing wall right off the driveway. Although, the color of the brick is rather orange, I didn't care if there was color clash, I had hopes that after a few seasons it would cover the trellis and obscure the wall with its lovely foliage and bloom. What I didn't take into consideration was that this delightful plant hailed from fresh water marshes along the southeastern coast from the Carolinas to Florida or that the next few summers in Middle Tennessee would bring moisture loving plants to their knees. I just knew that I loved it and like many a gardener before me, I fell for its pretty face, a pretty aster face in this case. That was 2009 and I am happy to report that it is alive and blooming in my garden today. Carolina aster has survived drought and flooding and has only required that I make sure it has good sun, a mulch to keep the soil moist and a big drink of water once a week during our hot, dry summers. I think it has been worth a little effort. resembles Symphyotrichum paten's flower and clasping leaf form. What makes this aster especially unique is that it's the only woody perennial scandent (climbing) aster in North America. Ampelaster carolinianus has sweet honey scented pink lilac flowers that bloom in late fall~October in my garden and November in warmer climates. Each flower is about one inch wide, and like other composite members of the Asteraceae family, each of the flowers has many tiny disk and ray flowers that make nectar and pollen for late visiting pollinators. Pretty flower faced Climbing Aster is a wonderful addition to a pollinator garden with its sweet honey scent, late season nectar and pollen source and most delightful of all, it's a host plant for the American Painted Lady butterfly caterpillar. Because it's a southeast coastal native of freshwater marshes or other damp places, it can take a saturated soil, but, it's equally happy in good garden soil that is well mulched to keep the roots moist. It does bloom best when the summers are wet (and we've had a good wet summer), but, to be honest, I need to water it weekly most July and August. I am happy it has survived 4 years of crazy Middle South summers and winters. If you're considering adding this sweetie to your garden please note that it hasn't tendrils to help it climb, so you'll need to provide a support with widely spaced slats for it to weave in and out as it grows. I think of it as a much branched sprawling sub-shrub that clambers up, over and through a trellis or vegetation. Let it climb or let romp through the border either way it looks good. It will grow as far south as Zone 9 and with protection as far north as Zone 6. It is by NO stretch of the imagination a xeric plant! It hails from the Southeastern US (Carolinas to Florida). Climbing aster "climbs" without the tendrils or other structures that one normally associates with vines. As such, it is not too aggressive, but, it can spread by seed. It can be grown easily from seed collected in the winter, or from cuttings taken spring through summer. It is deciduous, but will stay green well into early winter and remains leafless for only a few weeks in zones 8 or 9. It prefers a mostly sunny location and will not bloom well if given too much shade. A vigorous grower when happy, you might want to consider pruning it to maintain shape and size. Prune in late winter to control the growth. It flowers on new growth so chop away! To create an attractive self-supporting sub-shrub for the perennial border, cut it back for several years to shape and control. 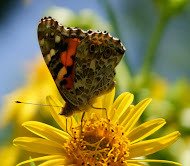 Like all asteraceae, it attracts many pollinators looking for nectar and pollen and is a caterpillar food plant for the American Painted Lady butterfly. It has a sweet honey like fragrance. Fall blooming until frost for all the bees and late visiting butterflies. I am pretty sure you understand the hows and whys that led me to toy a little with my garden guidelines. You've probably, already figured out that Carolina Aster is not just a pretty face, she's also a host plant for a butterfly that visits my garden and is a nectar and pollen plant for the other pollinators. In other words she's a perfect addition to a wildlife garden like mine. 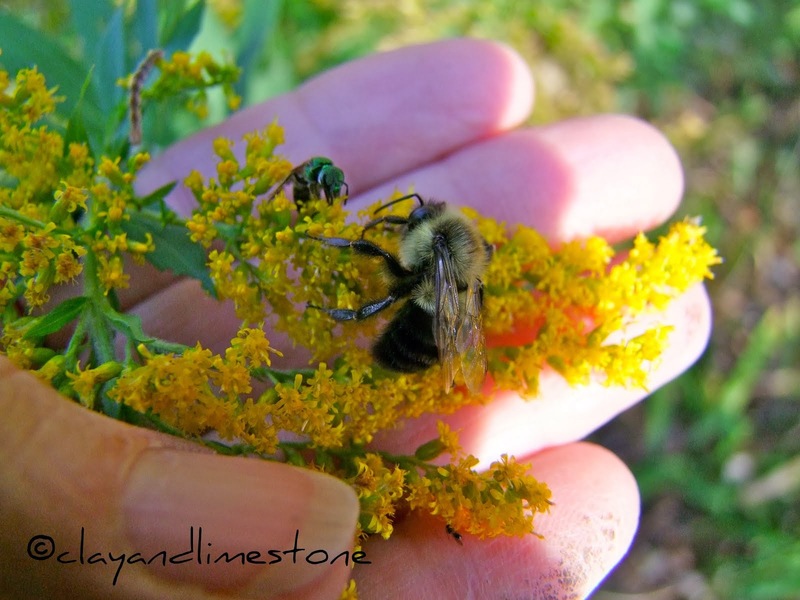 That's my Wildflower Wednesday story and I am sticking to it. Now let me here yours! Plants can be obtained locally at GroWild Native Nursery, online at Plant Delight Nursery and Brushwood Nursery. If i am the one who sees that i will also be totally smitten. Native plants are really difficult to kill, and yours is really very well worth your efforts. You know I am going to be out sniffing my asters today. Happy WW. Well, phooey, I think that Carolina aster is just out of my reach, zone wise, but maybe I should give it a try anyway? Yes, maybe I shall. Thanks for hosting Wildflower Wednesday, Gail. I've posted about a new old gardening book called Nature's Garden. Honey like fragrance - fantastic! Thanks for hosting Wildflower Wednesday. That plant looks like quite a sweetie! I've never heard of a climbing aster. I have some plants that are native to areas near us. Some of them like, like Zig zag goldenrod, to have some moisture, too. I've never heard of a climbing aster before--what lovely blooms! Well worth the extra watering it needs in the summer! I never heard of a climbing aster, and this one is out of my zone reach too, but I still treasure the asters I do have. My post today is about a roadside chicory - not an aster. Oh just when this sweet bloom captures my heart (beautiful images Gail) the truth is revealed... only zones 6-9. My zone 5 gardens are heart broken. We were ready to add this little darling to the fold. In my dreams. The climbing aster is so pretty and well worth keeping it going in your garden. Love the color against the house. Not xeric is not good in my garden. Sorry I'm a day late with my WW post. I did a two-fer with it, hope that's ok. I combined it with my Favorite Plant in the Garden. I am right on the edge in terms of an environment where it would thrive. My big concern is keeping it wet enough during the summers. My environment is changing and the summers are now definitely dryer. I am going to explore this further, this is really tempting. It is such a beautiful flower. Scandent plants are fun, I have a climbing aloe. For this October Wildflower Wednesday in a garden singing with flowers and enjoying light rain ... I am grateful to be able to prune trees, with a mastectomy scar. The flowers on the climbing Aster are very pretty, kind of swirly. I would be very tempted if they were also xeric, our summers are totally dry and plants that need water are hard to manage. My plant this month is the native ex-Mahonia nervosa. Finally linking in with one of my favs in my late season garden. I can see Gail why you were smitten with this aster...if it was a bit hardier and native to my area I would be planting this aster! I'd love to add this but I'm not sure I have a spot. But it would be hard to resist! It's a cutie. Gotta love a plant that thrives from drought to flood and everything in between. Plus, it climbs! I saw that at a specialty nursery once and was very intrigued! I love climbers. I can see why you fell for such a pretty face! I will now be on the lookout for this plant when I am tromping around wet areas of the southeast. I know we have saltmarsh aster (Symphyotrichum tenuifolium) on the fringes of my neighborhood, but I am not sure I have seen the Carolina Climber.